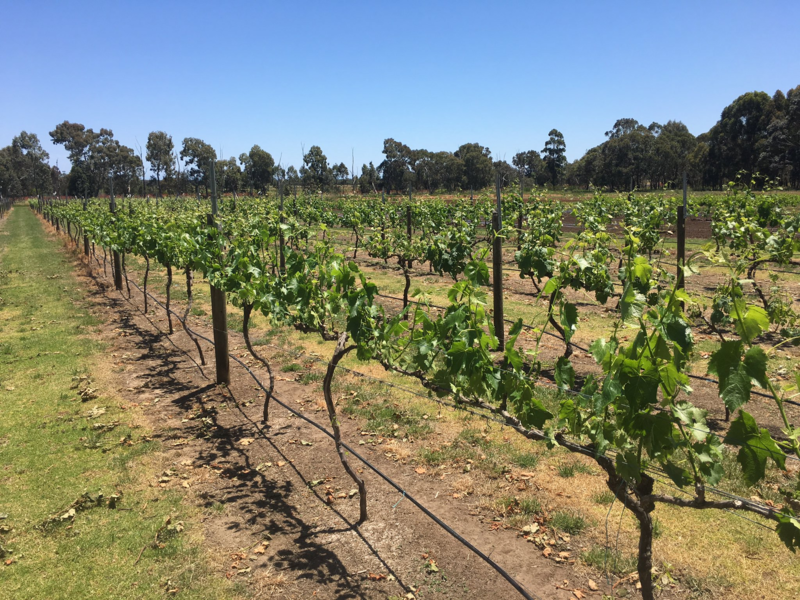 The performance of alternative variety wine grapes is continuing to be evaluated with a new trial block established near Wokalup within the Geographe wine region. After a decade of evaluating 18 alternative varieties in Manjimup, this new block will give researchers and industry alike a new perspective of how these varieties (plus new inclusions) perform in a warmer and drier climate. Approximately 80% of Western Australia’s wine grape production comprises of five ‘noble’ French varietals; Sauvignon Blanc, Cabernet Sauvignon, Chardonnay, Shiraz and Semillon. Reliance on such a small collection of varietals is a potential limitation to the sustainability and profitability of the WA wine industry when considering challenges such as climate change and market trends. Varietal selection is one tool available to growers to ensure continuation of optimum production, while addressing issues such as increasing temperatures, compressed growing seasons and limited water availability. This project builds on the knowledge gained from a previous evaluation of varieties in Manjimup and aims to change the way growers think when considering the varieties that best suit their region. Pairing varieties with climates (current and forecasted) has the potential to provide growers with the ability to improve their value proposition and sustainability. Planted in 2010, the block consists of 22 varieties planted in loamy soil on their own roots with 16 to 20 vines per variety. Split by skin colour, the tables below list the varieties, clones and their countries of origin. Over the coming seasons vine performance data will be collected. Small-lot wine making will be used to produce varietal expressive wines which will be assessed by an expert sensory panel. The information gathered from this work will be extended to industry stakeholders though a series of field walks, workshops and wine tastings. Details of these events will be provided in future editions of the Wine Industry Newsletter. This evaluation is a collaborative project led by the Department of Agriculture and Food Western Australia with support from WA College of Agriculture – Harvey, Western Australian Vine Improvement Association (WAVIA) and Wine Australia.